Stella Cherry tree was the first self fertile sweet cherry and is still the top choice for garden use. Pretty white flowers are followed by large, dark red fruits that are sweet and juicy with a good classic cherry flavour. The cherries can be picked around late July. As well as being a fantastic stand-alone choice, if you are planting another Cherry tree then Stella is an excellent companion as it is a good pollinator. 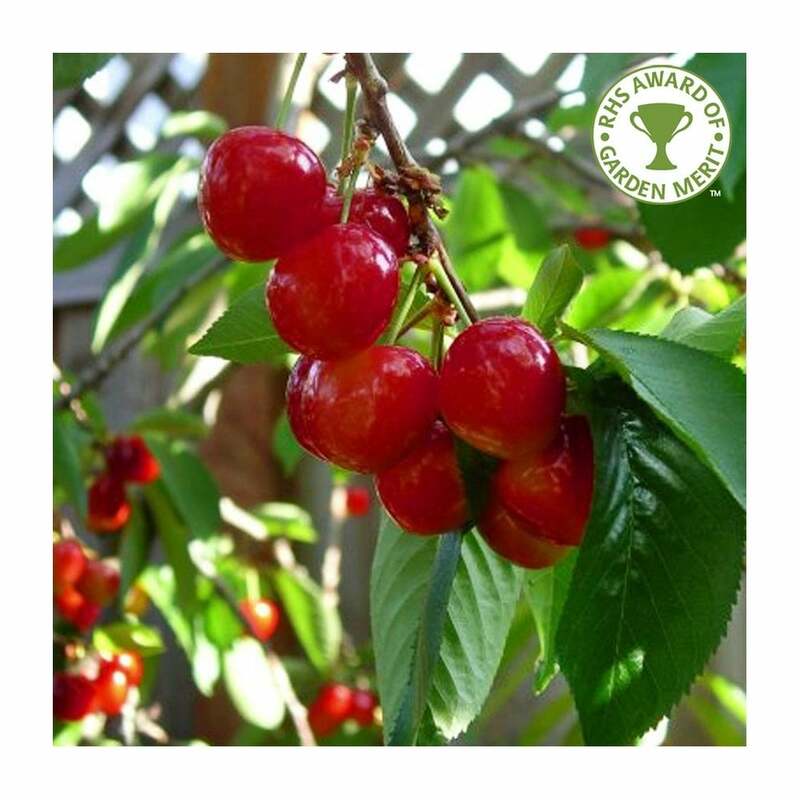 A very popular variety for its reliability and flavour, Cherry Stella has received the RHS Award of garden Merit and is often the first self fertile cherry tree that we recommend. Stella Cherry trees should be spaced according to their rootstock, for example a Colt (semi-vigorous) rootstock will require approx. 4 metres between trees, whereas a Gisela 5 (dwarf) rootstock will require approx. 3 metres between trees. Our pot grown cherry trees can be planted at any time of the year, whereas bare root cherry trees need to be planted between November and March. When planting pot grown Stella cherry trees, prepare the site by removing all weeds and grass within a metre of your desired planting hole. Dig a square hole as deep as your root mass and approximately 2-3x as wide. To help your tree establish more effectively, we advise sprinkling root grow in the hole, especially if you have poor soil. Gently loosen the roots and place into the planting hole. Using 50% of the original soil and 50% compost, fill in the hole and firm around gently. Make sure not to bank the soil up around the collar of the tree. We recommend planting fruit trees using a stake and tie and a rabbit guard. The Cherry Tree Planting & Care guide has further information and videos. Prune Stella Cherry trees for the first few years after planting to ensure a healthy, natural shape with a strong branch structure. Your tree should have one central leader and several side shoots. Straight after planting, trim the main stem back to approximately 120cm and the remove the lowest laterals, allowing at least 50cm of clear stem. Carry out this formative pruning in early spring. To maintain a strong branch structure, you should aim to have 7 or 8 main branches which are well spaced, allowing enough light and air inside the canopy. Stone fruit trees, such as cherries should be pruned in summer when they are stronger and less susceptible to disease. During summer, prune any crossing, damaged or diseased branches, all the while, making sure the overall form of your tree is balanced and attractive.